"Even when her science fails right before her eyes, she still has full confidence in it. Now, there's a leap of faith." When Kes wanders into an alien religious sanctuary and gets zapped, Janeway undergoes a religious ritual in an attempt to find out what happened and how they might be able to revive her. I'm not always wild about Star Trek episodes that deal with religion, partly because I'm religious and most of the writers aren't, and partly because their knowledge of academic theories of religion tends to be hopelessly out-dated and reliant on nineteenth century ideas about the relationship between magic, religion and science that have long since been discredited, but this one is really rather good. Forcing Janeway the scientist to take a leap of faith may seem somewhat out of character, but it represents a broadening of Janeway's horizons that's fascinating to watch. Janeway has been boning up on her comparative anthropology and is convinced she knows exactly what to expect from the ritual, while the guides/priests/spirits/whatever are clearly having far too much fun playing with her expectations. One of the themes of the episode is that Janeway thinks that she's terribly open-minded, but discovers that, in fact, her preconceived ideas about the shrine and the ritual were so set as to be fairly closed off. She keeps saying she has no idea what to expect, but in fact she has a very clear idea and is thoroughly confused when the ritual doesn't match it. One of the nice things about this story is that no one is trying to hurt anyone else. The Magistrate is anxious to help however he can and the religious authorities are 'honoured' by Janeway's request to undergo their ritual, rather than trying to block her. No one is even bothered by Janeway's subcutaneous device sending bio-chemical data back to her ship (which they seem quite amused by). It's a meditation on religion, spirituality and science that doesn't need an antagonist – it's focused on the much more interesting clash of ideals between equally kind and well-meaning but different people. 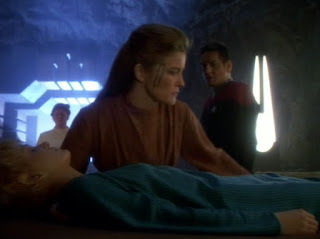 By the conclusion of the episode, there's a perfectly logical scientific explanation for everything that's happened, but one that Janeway is perhaps not entirely confident is the full truth, as there is also a spiritual explanation that could go alongside the scientific, which one can believe or not believe – just like real life. That ambiguity and the subtlety with which religious themes are treated in this episode is what makes it a much more interesting and compelling exploration of religion and science than many other Treks. - Granted, there were no warning signs or roped off areas or anything to indicate it was off limits, but really, Kes shouldn't have been poking around a religious sanctuary without knowing which parts were off-limits in the first place. - This episode guest stars Harry Groener, a.k.a. the Mayor of Sunnydale, who also appeared in Star Trek: The Next Generation's 'Tin Man' as well as various episodes of Star Trek: Enterprise and The West Wing. - This was the first episode directed by Robert Duncan McNeill (Paris), who went on to direct several more and these days works mainly as a director and producer on Chuck and other series. Old Man: She must like tests. I suppose tests make sense to her. Doctor: Mr Neelix you're wallowing... I'll have to ask you to stop, it's bad for the patient. Janeway: I don't know what I'm seeking. Old Man: If you can explain everything, what's left to believe in? Janeway: I want to believe it's possible. A Star Trek episode about religion that neither annoys me as a religious person, nor as an academic specialising in the study of religion – that's a miracle in itself. Four out of four mysterious alien sanctuaries. Love this review. You succeeded in putting down clearly the underlying intricacies that make this episode so special.